The southernmost city in the entire continental United States, Key West is one of the most naturally beautiful spots in all of Florida. Boasting a tropical climate and stunning scenery in every direction, Key West is such a pretty place you won't want to spend a single second indoors. Fortunately, there are plenty of excellent outdoor activities to enjoy. From fishing to snorkeling, many of the best things to do in Key West involve exploring the waters, and the area is especially excellent for kayaking. There are plenty of different kayaking companies to choose from all around Key West, with a range of different tours and rental options available to suit every kind of visitor. No matter whether you’re looking to have a close encounter with the incredible native flora and fauna or simply take in the breathtaking views of mangroves and the surrounding ocean, kayaking in Key West in one of the most exciting activities in the whole of Florida. Tourists flock from all four corners of the world to visit Key West. Florida is already known as a premium tourist destination with its Disney World theme parks and other attractions, but Key West shows off the real natural beauty of the Sunshine State, far away from urban areas and man-made structures. With sparkling turquoise waters, magnificent mangroves, astonishing wildlife and picturesque views in every single direction, there are simply so many reasons why someone might want to visit Key West. With all that natural beauty around, it’s only natural that kayaking in Key West is one of the very best activities to enjoy in this area. For many people, visiting Key West and jumping aboard a kayak is also a great way to get in touch with some stunning wildlife. Dolphins and sea turtles can sometimes be spotted, as well as countless types of fish and birds. Plant life can be enjoyed in abundance as well, with the area boasting some beautiful flowers and trees. 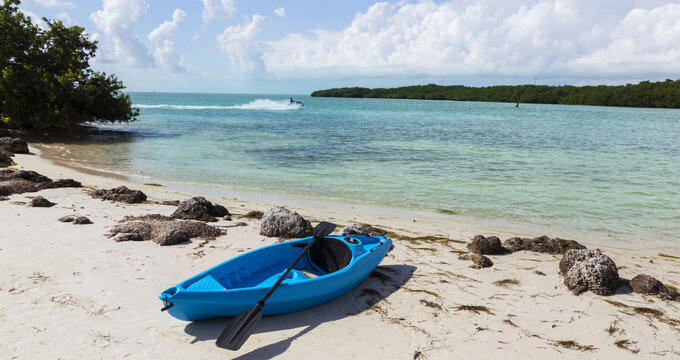 In short, if you want to enjoy the beauty of nature in one of the most peaceful and relaxing ways possible, a kayak tour around Key West is something you’ll adore. As previously stated, there are lots of different options for people looking to kayak around Key West. In fact, no trip to the key can be experienced without at least coming across a few kayaking companies, with each one proposing their own unique tours and opportunities. Some of the best rated kayak operators in Key West include Lazy Dog, Fury Water Adventures, Honest Eco, and Key West Eco Tours, but there are several other great Key West kayak companies to check out too, so it's wise to do plenty of research and shop around a little to learn all about your different options before signing up for a trip. All of these tours are run by trained, experienced, friendly guides who lead the way as small groups of kayakers take to the crystal clear waters of Key West and start exploring. Some kayak tours last for just a few hours while others are half or full day experiences. With hundreds of different mangrove islands separated by stunningly clear shallow waters, there's simply so much to explore around Key West on a kayak. Some tours also offer possibilities to snorkel and get up-close-and-personal with coral reefs and their underwater inhabitants. Every tour is fully safe and regulated to make sure every guest feels at ease and has the best possible time, and the tours are usually open to all ages. Kayaking is, however, a physical activity that does require some strength and fitness, so would-be kayakers are recommended to have decent fitness levels on longer tours. Each Key West kayak company will have their own rules and regulations, so it's worth getting in contact in advance in order to learn all you need to know and choose the right kayaking tour. Of course, if a guided kayak tour isn’t quite what you’re looking for, renting a kayak and taking to the waters for your own adventures is another great option. Various companies offer hourly or daily kayak rentals, allowing visitors to simply hop aboard and set off to make their own memories. This can be a really relaxing way to enjoy the wonderful waterways, lush vegetation and remarkable wildlife of the area, as well as letting you take the trip at your own pace, stopping as needed in order to truly appreciate all the sights and sounds and, of course, snap as many photos as you like.